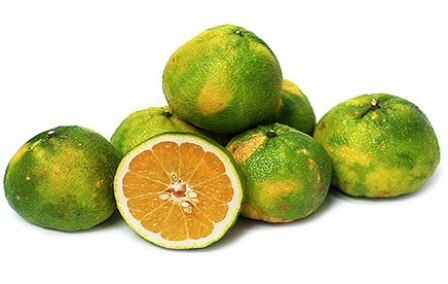 Ugli fruit is an unattractive looking mottled green and yellow citrus fruit. 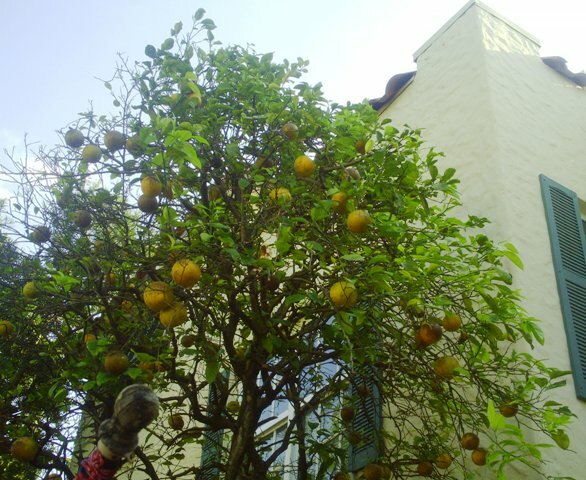 It is a tangelo, which are natural hybrids between a mandarin and grape fruit. 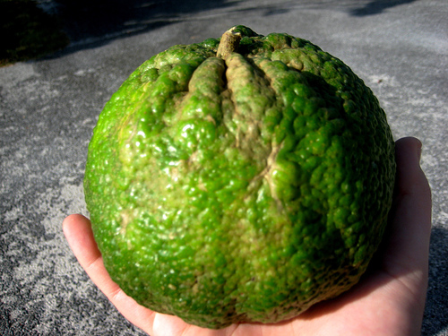 Ugli is native to the island of Jamaica in the Caribbean Sea. It probably originated near Brown’s Town in 1914, and was cultivated by F. G. Sharp at Trout Hall, and marketed by his son in the early 1930s. In Jamaica they pronounce it as “hugli”. UGLI® is now the registered trade mark under which Cabel Hall Citrus Ltd. markets its brand of tangelos from Jamaica. It is a tasty fruit, sweeter than grapefruit. Though not a good looking fruit, it still ugli sells in US at two to three times the price of a grapefruit. Ugli is grown in Australia and New Zealand. It has also been introduced into Florida, but does no do well there. The fruit is large, ranging in diameter from 10 cm to 15 cm. The colour varies from green to greenish-yellow, to yellow, and some even orange. The segments are large, less seedy and separate easily. The fruit is very juicy and can be easily squeezed. The juice taste quite sweet and does not require any additional sugar. It also does not have the bitterness of grapefruit. The flesh is orange to deep orange. The rind is fragrant too. 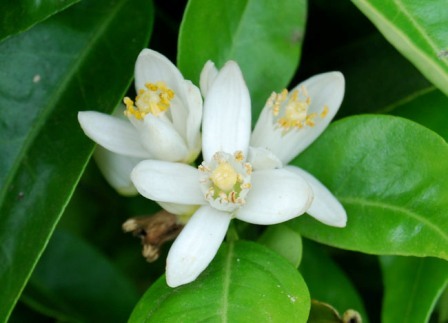 The fruits are easily peeled and may be eaten like a tangerine, or cut in half and eaten like a grapefruit. The pegs and juice may be used to make many sumptuous sweet and savory recipes. The fruits peel easily. The simplest way to serve ugli is to cut them in half, loosen the segments, and eat with a spoon – this is a delicious breakfast dish. For lunch or dinner, try sprinkling with sherry or Kirsch, and serving as a first course, or offer ugli as a fruit course for dessert. A glass of ugli juice makes a refreshing, flavourful change to fresh squeezed orange or grapefruit. The juice is delicious warmed as a hot toddy with rum, and sweetened with honey or brown sugar, or used to make ice creams and soufflés. Peel, slice away the pith and cut out the segments to use in a salad, as a cheesecake topping, or on its own as a dessert drizzled with sherry or Kirsch. The peel and juice together make marvelous marmalade.